" I think paranormal experiences are very personal, again, if they are that. Yes, sometimes I've felt that some things I would personally believe enough for me to take action on it... like, you know, I felt something happen in a hotel once that made me never stay there again. " Haunted lodging establishments have intrigued us all throughout history. Throughout the years, many individuals have shared their stories of paranormal phenomenon associated with hotels, inns, and various bed and breakfast establishments. 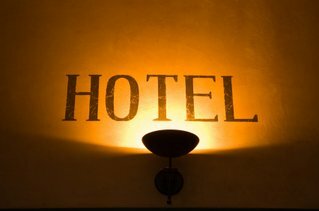 It seems that several spirits check in at haunted hotels and similar types of businesses and never check out – even though they are physically dead. The stories that have emerged from haunted lodging establishments come from employees that work at the structures, individuals that live in or near them and travelers that stay at them in order to rest. In this section of Greatest Unsolved Mysteries, you will learn the amazing tales surrounding these businesses. There are generally three individual types of haunted lodging establishments. These are inns, hotels, and even bed and breakfast businesses. In most situations where individuals claim that there is paranormal activity, the structure is relatively old or some strong situation occurred in or around the structure. Once this occurs, it is believed that those that are part of the spiritual plane are attracted to the building. Most ghost investigators believe that haunted places to stay such as hotels are haunted by residual hauntings. These types of hauntings are not considered to be actual ghosts, but instead they are recordings of energy that imbed themselves in a certain location for an extended amount of time. When studying real life ghost stories associated with buildings that provide accommodations to guests, you will find that there are many stories surrounding these structures that seem to indicate that there are intelligent hauntings, poltergeists, and even demonic hauntings also associated with such buildings. Throughout this section, you will learn about historical events surrounding various types of haunted establishments, ghost encounters associated with the structures, scary ghost video clips and real photographs of ghosts that have been obtained at these buildings, as well as the paranormal activities associated with various people throughout history. You will see, after reading these stories, why the lodges are considered to be some of the most mysterious in the world. Are the stories surrounding the Rawls Hotel true? The answer to this question is still one of the nation’s greatest unsolved mysteries. Many people that work and/or visit the Lemp Mansion believe that the spirits of those that ended their life in or around the structure are linked to the haunted house. Many paranormal investigators have conducted extensive research on this home.